Filed to: random information.Filed to: random information. There was a throwback by blackchair yesterday about a FP article on how to drive in snow, and since kinja2.whatever loads the comments from that article in the new posting it was pretty impractical to post a response to him and it seems like most of the comments centered around the difference between AWD and 4WD I though I would bring it up and let us fight about it here. Let me start by saying that there really isn't a right or wrong here, in that all these terms are marketing terms and have no strict definition, so don't get all in a huff if I call permanent AWD 4wd, or vice versa. I'm also going to go on record as saying that if you want the dirty details or history or entomology or anything like that, hit up wikipedia, this isn't going to be that detailed. Cons: cannot be used on the road, high driveline wear when used on high traction surfaces. Examples: Jeep Wrangler, 4x4 trucks, Nissan xterra, Toyota Tacoma, etc. There are auto 4wd systems that are this type but can shift into 4wd on demand based on sensor input as well. So why can't you use it on road? simple, you want to turn, right? As you can see, and as you probably already know, the inside wheel travels less distance in a turn than the outside and the same goes for the front and rear axles. While the side to side difference is taken up in a differential, locking the front and rear axles prevents the same type of differentiation from occurring. The result is: resistance to turn, wheel binding/hopping and driveline wear or damage. To put it succinctly; its unsafe to drive in part time 4wd for long periods on the road. AWD/Permanent 4wd, full time 4wd - There are many MANY different forms of AWD, but typically AWD seeks to solve the problems inherent with part time 4wd by solving the differentiation issue. Engine layout, transmission type and low range availability are inconsequential here as there are examples of each type, i.e. a system could be full time 4wd with a transverse layout and no low range. There are dozens of ways to do this and I will cover each briefly, but it boils down to the same basic principles; instead of locking the front and rear axles together you use friction plates, differential gearing or fluid coupling to take up the differential slack to eliminate binding. Typical on road based AWD systems simply use a single speed transfer case or PTO (power take off) and let the center differential modulate torque, However there are lots of full time systems with low range gearing and to tackle the duality of on road use a center differential with the ability to lock like a part time system for true 50/50 torque distribution better for off road use. Examples include: Land cruiser 80 series, the hummer h1, most land rovers/range rovers, Jeep quadradrive systems, etc. Examples: BMX x3/5, Toyota Sienna, etc. V VC differential is basically a torque converter, it has an input shaft connected that is fully decoupled to the output shaft and the medium of torque transfer is a fluid. In the case of most VC's, its a shear fluid that increases its viscosity when subject to high shear load. Most of the times its a 50/50 torque split like an open diff but when the front and rear axles are traveling at different speeds a shear force takes place that increases the viscosity of the fluid which increases the lockup of the input and output shaft while still allowing for differing speeds, as the sheer force increases you approach a lockup state that acts like part time engagement while still allowing some tolerance for different speeds in the axles. Helical cut/Torsen - Its hard to simply explain the process behind a helical cut but it goes something like this. The input shaft and output shaft aren't physically connected except at right angles by the element (invex here) gears. because of the helical cut nature of these and the spur gears they mesh with, they allow perpendicular motion only to transfer to the outputs. This means you can rotate the carrier and both input and output move at the same rate, when you have different speeds of input and output the element gears rotate to transfer the speed difference, but remain in mesh so there is a torque bias always to both shafts. Examples: Most audi's with Quattro (most VW 4motion as well), 1st gen hmmvw, continental GT, etc. Friction plate/clutch - again there are dozens of ways to do this, I will cover this generally. The friction clutch method is very popular because, with the advance in electronics, its possible to achieve very high variability in operation, smoothness and drive-ability, and advanced torque vectoring. The simplest way to explain it is that it acts an an open differential with clutch packs on the input shaft, output shaft or both to vary the friction inside the carrier housing from fully open to fully locked. Its important to note here that just because a diff is friction type, doesn't mean it has torque vectoring capability, or more accurately, overdrive ability. The Center diff in the subaru STI, for example, is off this type but despite its computer controlled operation, it is still only able to achieve lockup, it can't send more or less torque front to back that is predetermined by the mechanical bias built into the unit. typically these systems are set up with a bias 60/40, 70/30, etc and then lock up or slip in varying degrees to achieve a torque vectoring effect. These or VC diffs are the types of systems in modern full time 4wd setups so that you can fully lock up, or run in varying degrees of open to allow for speed differences. Pros: advanced functionality, variable profiles for terrain, can be fully open or even decoupled. Cons: expensive, require computer control, clutches wear out or can break, can be harsh. Examples: Subaru Sti, VW/Audi with Haldex AWD, etc. 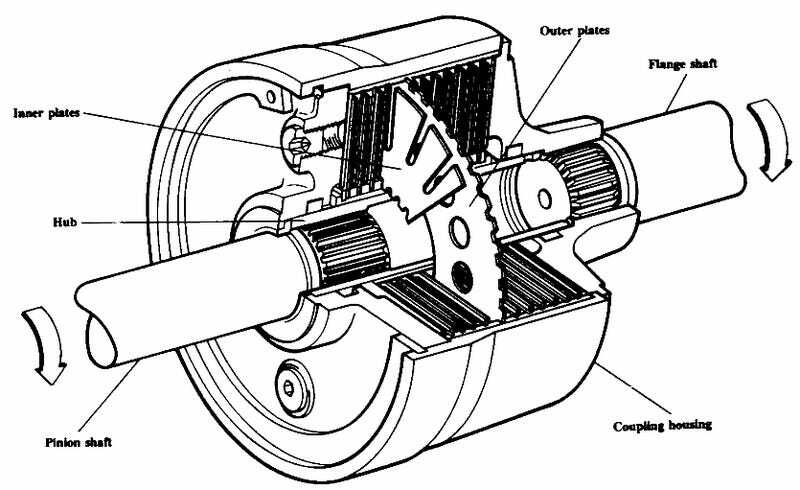 as a related but separate category there are advanced friction types with center and rear differential functions built into one unit, also there are ways to overdrive wheels be inserting small planetary gearsets in the output shafts that, coupled with variable lockup, provide overdrive to either front or rear axle. Sidenote: there are strange systems that don't conform to these rules (Ferrari FF, Hybrid 4wd, etc) but I didn't feel like including them despite #2.